In this file photo taken on September 8, 2007 shows the coast line of South Andaman Island near Port Blair, capital of the Andaman and Nicobar Islands. A US tourist was killed by arrows shot by tribesmen living in one of the world's most isolated regions tucked in India's Andaman and Nicobar Islands, police said November 21, 2018. He interacted with some of the missionary — who survive by hunting, fishing and collecting wild plants and are known for attacking anyone who comes near with bows and arrows and spears — until they became angry and shot an arrow at him. 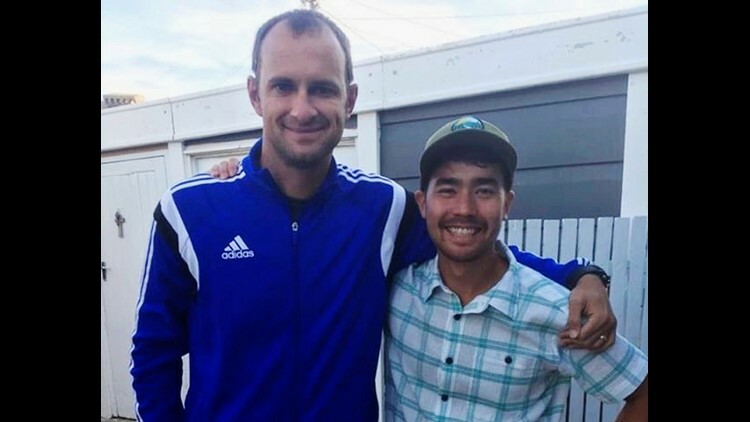 In this October 2018 photo, American adventurer John Allen Chau, right, stands for a photograph with Founder of Ubuntu Football Academy Casey Prince, 39, in Cape Town, South Africa, days before he left for in a remote Indian island of North Sentinel Island, where he was killed.